Our product range includes a wide range of side gusset on side seal bags. With the constant support of our dexterous crew of professionals, we are fulfilling the varied requirements of clients by offering optimum quality Side Gusset On Side Seal Bags. 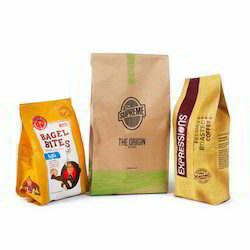 Our offered bags are widely demanded in food industry in order to pack the food with outmost hygienic. These are precisely manufactured using optimum quality raw material and latest technology. In order to ensure the quality of bags, our quality controllers test them on various quality parameters. Apart from this, we provide our entire range in various specifications, in order to meet varied needs of our clients.